Margriet Eshuijs was born on October 14, 1952. Both her parents were musicians. They owned a music store and also gave lessons in music. It was almost inevitable that she would become involved in music herself too. In 1972 she joined the band Lucifer, a Dutch band that would be immortalised with their 1974 hit 'House for sale', on which Margriet performed the vocals. By the end of the Seventies the band broke up. 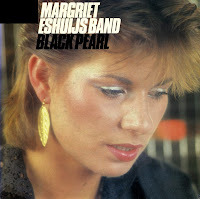 In the early Eighties the Margriet Eshuijs Band started. The album 'Right on time' (1981) contained the single 'Black pearl', which would reache number 13 in the Dutch Top 40 in March 1982.